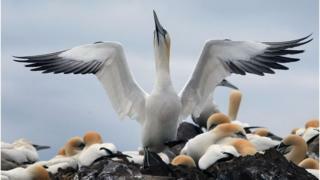 A gannet bonanza has been confirmed on the towering cliffs of Yorkshire by research from the RSPB. A survey shows the cliffs around Flamborough Head and Filey are home to 412,000 seabirds including gannets, puffins and razor bills. Since 2000, the number of gannet pairs on the cliffs has shot up from 2,550 to 13,400. But the charity warned that overall seabird numbers in the UK are faring badly. It wants funds for a full national census, but says research money from government is hard to find. The RSPB is celebrating the gannet invasion, though. The clumsy clamouring birds are attracted by plentiful nesting sites on a 17-mile stretch of cliffs up to 400ft high. They feast on abundant fish on the nearby Dogger Bank. It is within easy flying time, which allows them to make multiple trips to secure food for their young. The RSPB’s scientists are trying to fathom exactly what has created such a huge population increase in a short space of time. They say the success of a colony is the ability to raise chicks with steady supplies of food, and note that almost all gannet chicks survive whereas the chicks of sea birds on other sites often perish. Gannets capture bigger fish than most other sea birds, so they can scoop up mackerel out of water. Ellie Owen, seabird conservation scientist with the RSPB told BBC News: “Gannets used to be hunted in some places, but that doesn’t really explain their success in Yorkshire. “One major factor has been the good fortune of feeding. From an oceanographic point of view in the North Sea in summer there are strong flows from the NE English coast, past the northern edge of the Dogger Bank, and NE to the Skaggerak. “There is a lot of mixing of waters and nutrients, making the waters rich in plankton and fish. The team funded by Natural England to survey the Yorkshire cliffs took experts 253 hours, including 214 hours spent on a boat counting the nesting birds. Sea birds elsewhere in the UK appear to have seen big declines, although the scientists can’t fully work out why some are failing to raise chicks. Since 1982, the UK’s Seabird Population Indicator – based on breeding numbers for 13 species of seabird from a handful of colonies – has declined by 22%, with most of this decline taking place over the last 10 years. This has made some species and sites very vulnerable, that charity says.